Did you know May is National Salad month? Don’t you just love these food holidays which gives us every excuse to eat (and post pictures of) all the yummy things? With Cinco de Mayo only a few days away, you better believe my first salad of the month just had to be something inspired by Mexican flavors. Thankfully, Taylor Farms has a Southwest Chopped Salad which makes this salad come together so easily. The salad is already washed, chopped, and ready to go. It even has a blend of romaine lettuce, cabbage, carrots, and cilantro, which I love not only for the flavor, but it also has the perfect crunchy texture you look for in a salad. It’s so convenient because it already comes with everything you need to make a quick and delicious salad, including some toppings and a dressing. You can keep it simple by using the kit alone or you can use it as a base to add some additional veggies and/or a protein, like grilled chicken or fish. I loaded this salad with my favorite taco fillings, like black beans, corn, avocado, onions, and peppers. I even took a couple of the veggies one step further and grilled them to bring out even more flavor. I’m telling you, that extra simple step totally took this salad to the next level! The only thing a great salad needs to make it even better is a good dressing. I used the cilantro dressing that came with the salad kit and just blended in an avocado and fresh lime juice. A quick whirl in the blender and voila, an easy “homemade” dressing that is so creamy and delicious. 2) Create an original Instagram post with a photo featuring your best salad and add the tags #SweetSaladSkills and #TaylorFarms in the main post caption (not as a comment after you have posted) for a chance to win! The contest is for U.S. residents only and will remain open until 5/31/17 at 10:00am pst. Taylor Farms will choose a total of 5 lucky winners/1 winner every week, which will be announced on the @YourTaylorFarms Instagram page. Good luck! A quick and delicious taco salad made easier by using a salad kit! Full of veggies and black beans, which adds loads of flavor and also makes this hearty enough to enjoy as a full meal! Open the Taylor Farms salad package and remove the dressing/topping packet from the bag. Empty salad contents into a large serving bowl and set aside. Preheat a gas grill or grill pan to medium-high. Place ears of corn and whole bell peppers onto the hot grill and lightly char on all sides. Alternatively, if you have a gas stove you can also place corn and peppers directly over the flame to roast, turning often until lightly toasted on all sides. Slice peppers in half and discard seeds and stem. Slice peppers and add to the salad. Cut kernels off the cob and add to the salad, along with one sliced avocado, drained black beans, tomatoes, cucumber, and onion. Top with salt and pepper and gently toss together until ingredients are well blended. Keep refrigerated until ready to serve. Before serving, top salad with tortilla strips and pumpkin seed mix from the kit. Serve with additional tortilla chips, lime wedges, and the avocado-cilantro dressing. Serves 4-6. **If you don't have the packets, can also blend together 1 ripe avocado (peeled and pitted), ¼–1/2 cup cilantro (or more to taste), 1 garlic clove, ¼ cup olive oil, juice of ½ lime, ½ tsp salt (or more to taste), pinch of black pepper, enough milk to thin. This salad is GORGEOUS! It would be such a beautiful centerpiece for a cinco de mayo party buffet! I especially love all of the bright colors and roasted veggies — the corn is so so so pretty! I love when food is pretty and good for you! I’m definitely going to pick up a few bags of the salad mix. We’re not big salad eaters so having it prepped and ready will make it so much easier for us to make it with dinner! Perfect for Cinco De Mayo!! Love your pictures as well! This is hands down the most epic salad I’ve ever seen! The grilled corn is like the icing on the cake! So many yummy flavors! Thank you so much Nisha! I really appreciate the encouragement. Have a lovely weekend, friend! Wow! This looks so yummy and so colourful! I love how fresh it looks, too. Officially making this tomorrow night! This is beautiful! I love everything that’s on this salad. Grilled corn is my current obsession. I love that all the lettuce is ready to go because washing and chopping lettuce is kind of the worst. Thank you friend. Have a wonderful weekend! Oh man, this look delicious! I think I’m going to try it next week. Beautiful photos, as well! I LOVE salad kits! I buy them almost every week for one of our dinners. I add my own touches too, but yours looks divine! I am excited to try it!! Thank you! Thank you for the kind words Carly! I hope you have a great day! 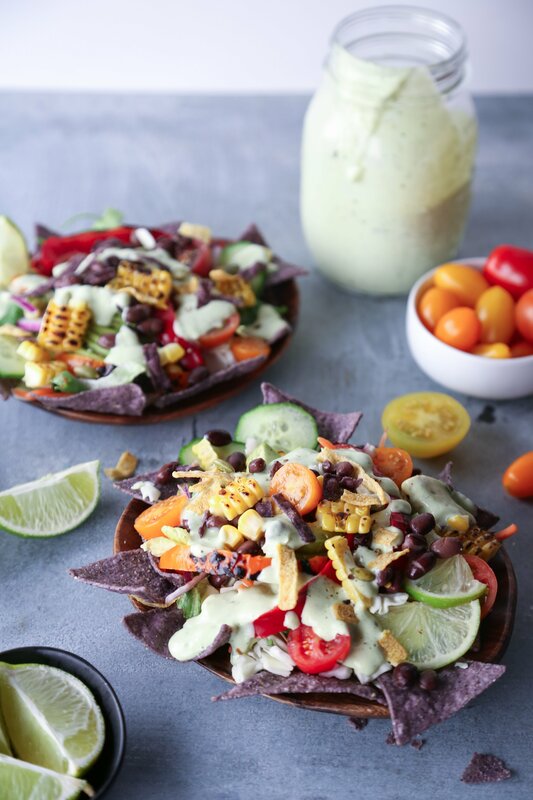 Wow this looks like the best taco salad ever, cant wait to try, fab pics as well! 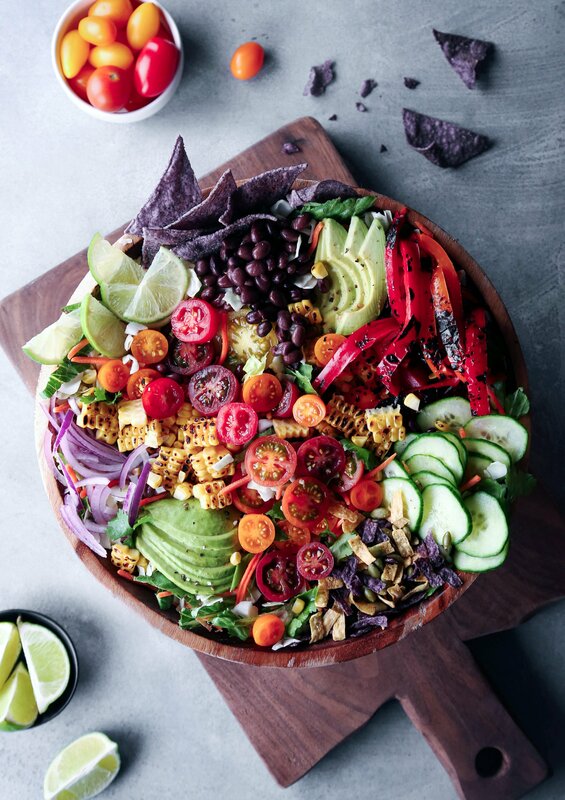 This is the most beautiful salad I have ever seen – and I’m SUCH a fan of southwestern salads. There’s just something about corn in salads that I lovelovelove! Aw, thank you Erica! I hope you have a wonderful week! I am drooling so much right now and my stomach is rumbling. This looks SO good. I can’t wait to try it out.